The current article focuses on the key signs of financial shenanigans / accounting gimmicks, which can help investors identify the accounting red flags in the companies they are considering for investment. We all know about one company or the other, which had resorted to accounting gimmicks to dupe investors. Instances of management manipulating the books of accounts are not bound by any geography, race, religion or culture. Be it USA (Enron, Worldcom), Europe (Paramalat), India (Satyam) or Japan (Toshiba), each market has its own share of ‘stalwarts’, who instead of genuinely improving the business, decided to cook the books to show better performance. Now a days, most of the companies offer share price linked incentive schemes to their managers. Such schemes are offered to align the interests of managers and shareholders so that both can benefit by good performance of the company and its stock. However, these schemes have acted as double-edged swords. Share price linked incentives motivate managers to work hard and show good performance. Nevertheless, when times are tough and business is slump, they offer easy incentives to managers for dressing up the accounts to show a good picture to the markets to shore up the share price. In the hindsight, the analysis of disclosures & exchange filings of such companies has always pointed to the accounting gimmicks, which could have helped investors in identifying the red flags. However, the key is to identify such clues before the problems becomes large enough to affect the share price. These clues, if identified at right times, could have guided investors to exit before the nefarious acts of these companies became public and their prices fell like a pack of cards. Therefore, it becomes essential that all stock market investors, be it institutional or individual should learn the tools/signs that can indicate, when a company starts deviating from the standard practices and the possibility of an underlying fraud becomes a real possibility. The signs that can tell an investor, whenever something is not right with the presented accounts. An investor can then, analyse the company deeper and rule out whether the company is trying to falsify its books and if so, then can exit the company’s stock at the earliest opportunity. Recently, I read the book: “Financial Shenanigans: How to Detect Accounting Gimmicks & Frauds in Financial Reports” by Howard M. Schilit and Jeremy Perler. This book provides a comprehensive account of the possible accounting gimmicks that managements can play to dress up their financial statements. It helps the readers identify the signs/tools that could have caught these accounting shenanigans at an early stage. The book explains various methods deployed by companies in the past to manipulate their earnings, cash flows and balance sheet metrics. It then, takes the reader through the key parts of their disclosures, which could have directed a discerning reader to the gimmicks played by the management. Finally, the book explains to the reader with calculations, various ways to find out the correct earnings and cash flows from the inflated numbers presented by the companies. “Financial Shenanigans” provides an easy to read and simple to understand explanations of complex circuitous acts of managements to dress up their financials. The current article attempts to summarize the comprehensive effort of the authors, Howards Schilit & Jeremy Perler, and presents the gist to investors to sensitize them about the need to learn more about such accounting gimmicks. Most of the attempts to dress up the accounting books by management are focused on manipulation of earnings (revenue & profit), cash flows and balance sheet to present a better picture of deteriorating financial situation. Most of the companies attempt to show higher revenue & profits during the current period to meet or exceed market expectations. Higher earnings in current period acts as a strong factor to raise the market price of company’s shares and increase the wealth of promoters/managers who stand to benefit from their stake/stock options in the company. However, there have been cases when companies have tried to mask the current good performance and tried to defer revenue/profits to a future period so that they can show sustained performance during upcoming tough times. Deferring current good earnings for future periods helps the company to show sustained performance during bad times, thereby, giving the impression of resilient business model to the markets. Stock markets usually assign higher multiples (P/E ratio) to such companies, which show stable performance with low volatility in earnings. Therefore, the management has sufficient incentive to act both ways. the presence of three financial statement: Balance Sheet, Profit & Loss and Cash Flow Statement, which talk to each other. If the management tinkers with one of these statements, then there is very high probability that investors would find signs of unhealthiness in other two statements. We would look at the methods to detect earnings manipulation by management in the later part of this article. Most of the corporate frauds in 1990-2000s involved the companies showing super-normal growth in revenues & profits. However, upon analysis of cash flows, it could easily be deciphered that the earnings were not backed by cash flows. Therefore, all the investors started analyzing cash flow statements to see whether the profits are being converted into cash flow from operations to verify the genuineness of earnings. Cash flow from operations (CFO) became the key parameter to analyse companies. However, the ever-evolving managements realized this pattern and soon enough devised techniques to manipulate cash flow statements as well, so that they could hide ineligible/bogus revenue practices from investors. However, in these cases as well, the mandatory requirement of reconciliation of three financial statements helped the investors. Reconciliation requires that all the entries of cash inflow or outflow have to be in the cash flow statement and the management can only change their classification from one head to another. Therefore, if an investor uses certain adjustments in her analysis of cash flows then she can easily detect such shenanigans and improve her stock analysis to reflect the true economic reality. e.g. by selling them, showing them in other receivables than account receivables, changing definitions of DSO (days of sales outstanding or receivables days) etc. By classifying certain inventory as noncurrent saying that it will not be used within one year. Using only in-store inventory and excluding warehouse & transit inventory etc. mainly applicable for financial institutions, which might use various tricks to hide the actual stress in their loan books. Many a times, managements create new parameters to describe their business performance. Such parameters are not the standard parameters of profitability or efficiency as described in accounting standards. However, many times, they help investors understand the status of companies of any particular industry in a better fashion. Managements may alter the vintage/criteria of the eligible stores to be used in calculation of disclosed metric. Companies have been known to show high level of reverse engineering skills to create such eligibility criteria to show desired trend in performance. The key here is what constitutes the revenue and the number of users in ARPU. Management of one company may exclude advertisement revenue and report only subscription revenue whereas management of another company may include advertisement and other certain items as well. Similarly, different companies may use different criteria to select the number of users for calculating ARPU. Some companies may add up subscribers of unconsolidated entities/JVs as well, while others may not. Some companies may not disclose the details about orders, which might contain cancellation clauses/indemnity clauses and club all orders as if they might be firm sources of revenue in future. Some companies may act as if key expenses like depreciation, interest etc., are irrelevant for businesses and investors. For many companies, like rental cars, depreciation is the real cost of inventory & operations. Looking at EBITDA only for such companies is highly misleading. Some managements may stress on cash earnings as if changes in working capital do not matter for businesses. All the above described methods have been used by one company or the other in past to dress up its books in order to hide their deteriorating financial position from the markets & investors. The book “Financial Shenanigans” provides detail of each of these tools used by different managements with real life examples. “Financial Shenanigans” delves deeper into regulatory & exchange filings done by these companies and digs out extracts from their disclosures, which if noticed by investors, could have alerted them about things not being right. Then, the investors could have analysed it further to reassess their investment positions. As discussed above, if any company inflates its revenue by either accelerating its revenue recognition or recording false/bogus revenue, then there is high probability that such revenue would not be backed by collection of cash. In such cases, the cumulative CFO would fall behind cumulative PAT. Therefore, investors should always compare cCFO and cPAT of any company over last 10 years and be wary when cCFO is significantly less than cPAT. Such companies would require enhanced due diligence to identify the accounting gimmicks and before the investor commits her hard earned money to them. Similar to the above point, inflated revenue recognition without backing of cash collections would lead to continuously increasing account receivables/trade receivables/debtors in the balance sheet. The increase in account receivables, if at a faster pace than increase in sales, would increase the Receivables Days/DSO. Many a times, such receivables could be bogus receivables, which might not be realized ever. Therefore, the investor should be wary of investing in companies, which show continuously increasing receivables days. Similar to the increase in account receivables, a continuous increase in unbilled receivables also reflects an aggressive revenue recognition policy. Investors should be very cautious while analyzing companies with large amount of unbilled receivables like infrastructure companies and EPC contractors. Moreover, investors should also be concerned when they see a large drop in DSO/receivables days especially after a period of rapid increase in DSO. This is because, such drop in DSO might be due to the management using the tricks to either sell receivables off their books or classify them under any other head in balance sheet. Inventory buildup may indicate that the company might be carrying old inventory on its books, which might not be useful anymore. Management may hesitate before writing off such inventory, as it would have to book impairment losses, which would reduce earnings. However, such write offs if genuinely needed, then cannot be deferred indefinitely and companies end up recognizing major impairment losses all of a sudden. Such large losses affect the earnings in big way and no doubt that the share price tanks both due to losses and due to management quality concerns. Therefore, an investor should do extra due diligence when she comes across companies, which have continuously decreasing inventory turnover over the years. This is one of the common financial shenanigans used by companies. “Financial Shenanigans” mentions many cases where companies tried to inflate their earning and CFO by capitalizing normal day-to-day operating expenses. By using these accounting gimmicks, the companies derive dual benefits. They improve their profits as they do not deduct these expenses from revenue and at the same time inflate CFO as they show these expenses as cash outflow for investing section rather than in operating section. Detecting such tricks can be quite challenging for an amateur investor who does not have deep understanding of accounting & finance as well as does not have sufficient spare time to spend in deeply analyzing financial statements. However, the investor can safeguard herself from these management tricks by using a simple method. This method is using the Free Cash Flow (FCF) rather than Cash From Operations (CFO) for her analysis. FCF is arrived at by deducing capital expenditure (Capex) from CFO and thereby taking care of the operating expenses excluded from P&L and shown as cash outflow from investing section. focus more on cash flow statement than P&L. Moreover, she should rely more on FCF than CFO, while analyzing cash flow statement. The investor should be cautious when she observes declining free cash (FCF) while strong CFO in the cash flow statements. Acquisitions are a favorite area for over-smart managers to hide a lot of things under the carpet. Analysis of financials become a lot complex when two companies merge with each other and the management presents combined financial statements for the two companies. Account receivables of the acquired company, when received, flow through the CFO of acquirer, whereas the costs incurred to generate these receivables (inventory bought by the acquired company, salaries paid in past etc. ), which ideally should flow through CFO as outflow, now flow through CFI as outflow as acquisition cost for the acquiring company. We can see that if any company that tries to grow organically, then it would have to do a lot of cash outflow from operations (inventory purchase, salaries etc.) to generate cash inflow from operations (CFO), whereas in acquisition, the acquiring company gets target’s future cash inflow from operations (outstanding account receivables at time of acquisition) but its related cash outflow (acquisition cost) is recorded as cash outflow from investing. Therefore, acquisitions provide a legal method of boosting CFO. No wonder once companies realize this, they become serial acquirers. This is not to say that such companies would not have inherent business strength to show exceptional performance. However, there is high probability that management of such companies might be using accounting gimmicks to manipulate their accounts to show such performance. Therefore, it is advised that the investor should do enhanced due diligence while analyzing these companies. An investor should always ask herself the question: Why the particular accounting change and why now? Be wary when company stops disclosing an important metric. Failing to highlight off balance sheet obligations/contingent liabilities like corporate guarantees given to bank for loans taken by other parties or a lawsuit or claim filed against the company. New disclosures should provide more answers not give rise to many new questions. If reverse is true, then management is hiding something. These are some of the accounting gimmicks described by “Financial Shenanigans” to help investors recognize accounting manipulations at initial stages and protect their hard earned money. 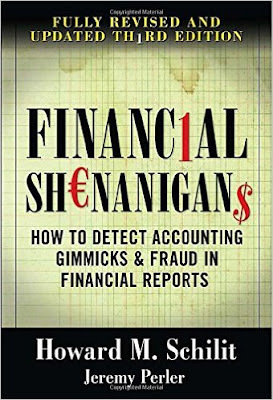 After reading the book “Financial Shenanigans”, the reader would realize that managements of many of the well-known names in the world have used accounting gimmicks at some point in time. They have mostly been caught by regulators, penalized, and directed to rectify their books. It indicates that no investor is shielded from accounting juggleries and she can ignore learning about at her own peril. The book describes numerous accounting gimmicks that have been used by firms and similarly many other ways/indicators, which can highlight the use of nefarious methods in financial statement. However, covering all of the accounting gimmicks is not possible within one article. However, the investor should be aware that ever evolving financial landscape would provide newer opportunities for over smart managements to use shortcuts to achieve their targets. Therefore, it becomes essential that every investor should learn about the basic tools that highlight any accounting manipulation. She should use these tools regularly in her stock analysis so that she can avoid investments in fraud companies and save her hard earned wealth from erosion. With this, we have reached the end of this article on financial shenanigans/accounting gimmicks. It would be my pleasure to learn about your experiences, whether you have faced any of the companies in your portfolio using smart techniques to hide its problems. If yes, then what were those methods? What were the indicators that sensitized you that something is not right and how did you confirmed your suspicions?